It is time for these concerned and involved citizens to say "enough is enough." We've seen the enraged parents, the protests and the shady actions by the School District. I don't pretend to know where to start, but I wonder who is with me? As my 4th graders begin their research projects we have been discussing and experimenting with keywords. Today they put together a list of questions about their topic (a famous African American) to prepare for starting their research. I gave them a choice of how they listed the questions. I modeled the list method and the 'idea map' (graphic organizer) method while also telling them that they could organize their questions in whatever fashion made sense to them. 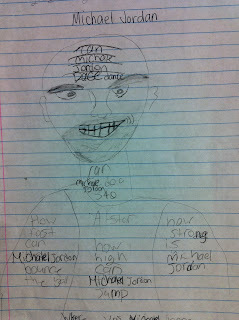 As I walked around I noticed a big drawing of Michael Jordan on one of my students' papers. This student had been asking lots of questions about the assignment, but I had been so sure that we had cleared everything up, so my hear sank when I saw the drawing. I double checked with the student as I approached to take a closer look and he looked at me and said, "You said we could do it however makes sense to us, right?" I looked closer. He had been writing his questions inside the drawing! It made my day. One my recent obsessions this school year is figuring out the best assessment strategies and methods of reporting student progress. While I have not even covered the tip of the iceberg when it comes to mastering how I assess my students and provide them with timely, meaningful feedback, I have been struggling this year with translating these practices into the limiting, number-based, weighted, percentile gradebook system that I am currently required to use. I recently tweeted out that I needed to be a software designer so I could develop a system that would allow me to report how my students were progressing on standards along with the ability to provide individualized comments. Within minutes I received a tweet from Riley Lark, who stated that he himself had gone through the same challenge and had come up with a solution himself. 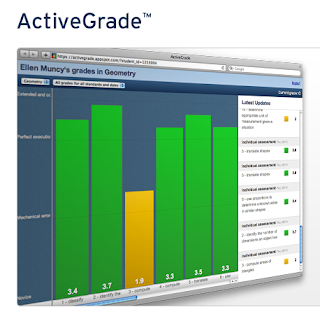 His solution, ActiveGrade, provides a customizable gradebook that allows the teacher to enter standards, assessments and grades based on either a percentile scale or a rubric scale. Teachers can then print out or email customizable reports that automatically populate individual grade reports in the form of a letter for each student. Teachers can input personalized comments for each student to be included in the report. I tested it by easily copy/pasting in one of my class lists and was quite satisfied with the report it created. I was also excited by the opportunity to show a list of standards rather than random-seeming tests/quizzes or other assessments that don't paint a complete picture of what a student knows or doesn't know. All assessments can be grouped by standard to paint a picture of a student's progress toward mastering a standard. You can try it for free for 14 days or pay just $12 until September. If you want to start using it next year it will cost about $40 for the entire year. What Can We Learn from Gaming? I have been thinking a lot recently about video gaming and what we can learn from it as educators. This is not a new concept or a new discussion. I've been seeing things happen in my classroom that really make me think there's something to this idea. My recent reflections and changes in classroom practice don't actually involve my students playing games to learn new skills or concepts (though there is research about the positive effects of this), but rather on the broader structure of games in relation to classroom practices. I feel that I am a Jane of all trades and a Master of none. I work hard all day ensuring that I am the best teacher I can be, and then I come home to be the best girlfriend I can be while also maintaining blogs, an online professional life, working to start up a food co-op and maintaining priceless face to face friendships. When I log onto Twitter and Facebook these days (it's been less and less recently) I notice the same names and handles scrolling by and I wish that I had time to be so connected, to devote so much time to sitting in front of the computer. 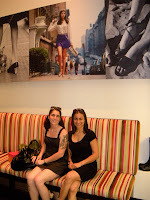 Part of it's my own fault--I can't say "no"--and part of it is because I crave dialogue and love learning new things. However, is it worth barely talking to your loved one for hours at a time while sitting mere feet from each other? Can it replace a drink with an old friend or a night hanging out with the ladies? Is it more important than getting to know my community and becoming involved in local issues that directly affect me? Don't get me wrong. I'm not giving up entirely, but I will need to make a list in the coming weeks and begin to pare down my responsibilities and my priorities. I am invested in my professional community, many of whom I now consider close friends, and I am invested in the future of education as we know it. I can't detach myself from the world I dove into almost 2 years ago and I won't. However, I know that I don't NEED to be online 24/7 and I know that those relationships will still be there as long as we are all dedicated to what we do day in and day out. So for now I will focus on my relationships, my teaching and the co-op that myself and my colleagues have worked so hard to bring to this point. I will blog about my teaching, I will read my RSS feeds, I will travel to conferences and engage in dialogue, but you might not 'see' me around as much. I'd rather get a hold on what's important than try to do a lot of things poorly. I have been fighting filtering battles ever since I first entered a computer lab as a technology teacher almost 4 years ago. Today I got my vindication. I am lucky that my new school does not block YouTube. My 6th graders are doing research projects that will culminate in them creating a Google Site about their topic. Today they began to (yes, it's old school) sketch out on paper a basic design for their site. As they thought about their homepage, many of them asked if they could use video. "Of course," I replied. I quickly harkened back to last week when my friend Ann and I were embedding video into a Google Site for a presentation we did together this weekend. "Go to YouTube," I said. See if you can find a video there. YouTube videos are easily embeddable into Google Sites with the click of a button. The task was authentic, and they had a purpose for searching the site. Blocking these kinds of resources denies our students access to material that is relevant, interesting and informative. One student, who is researching drums, bookmarked a video of Justin Beiber playing the drums in her Diigo library with a note: "Even famous people play the drums." Another student found a video of a lightning storm for his site about lighting and electricity. If we design authentic and meaningful experiences and use good classroom management and common sense when using these tools, we can rest assured that little harm will be done. Passion is when we lose ourselves in a task, when we never get tired of engaging with something, when we become emotionally invested in something. Angela Meiers suggested that part of being passionate is suffering. While I'm not totally convinced that you need to suffer to be passionate, I think that there is an emotional investment in our passions. We can't expect children to find their passion if we don't expose them to as many experiences as possible and let them tinker with ideas and try out different roles? This is one of my recent obsessions (grading, assessment in general) and I was lucky enough to sit next to a technology teacher like myself who does a standards-based report card for her class. 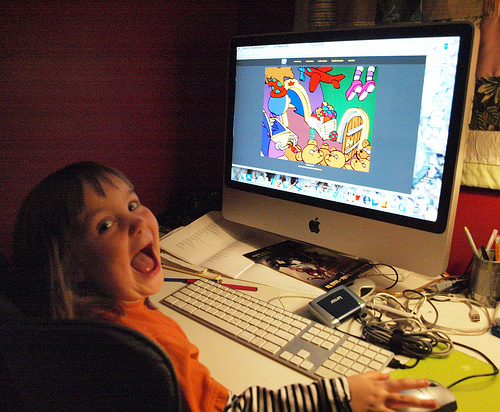 She shared a great site with me: SnapGrades. This site does have a fee, but it creates standards-based report cards and aligns perfectly with my current classroom practices. There is a lot of education that needs to be done with the families when switching over. George Couros spoke about how he was clear with the parents about why they were switching to narrative report cards rather than grades. Standards based grades are a better indicator of what your child really knows. When we average out grades, we penalize students for growth. When we give students zeros, it's an easy way for them to 'check out' and not learn the content. I could talk about this topic for DAYS. I loved hearing what George Couros had to say about his school's approach to getting rid of grades. He explained the move to the parents by telling them that it would be a true reflection of what their child knows. There was also a lot of talk about the disconnect between K-12 and Post-Secondary education, especially when it came to college acceptance. There was some great conversation here about what students 'need' to know and the kinds of skills they need to be successful researchers. In addition, there was some conversation about 'old school' vs 'new school' methods, tools and resources. You can't teach research unless students are actually DOING research. They need to learn while they are doing. Use citation tools to make citation easier (http://easybib.com)---BUT knowing citation is an important skill. It is like knowing the common code of communication for information. Do term papers serve a purpose or are they an outdated form of assessment? Do we love or hate Wikipedia? It lets students know when articles are poorly references, provides additional resources at the bottom of articles and includes things that you won't find in a traditional encyclopedia. However, for younger students it can be hard to read and digest while also evaluating the content. Students need to know how to evaluate information, collect information, synthesize what they have collected and be fluent in using keywords. They also need to know where to go for the information they are seeking. This was possibly the most engaging and fascinating conversation I had all weekend. Neither David nor Laura provided concrete answers, but rather presented us with a continuum of probing questions. Me likey. I think we all need to bring it back to our schools. Is the notion of what it means to be literate different? Has literacy changed? Was there literacy before there was reading and writing? Is there digital literacy or is it just literacy in a new context? We are now reading in new places, so we often read more than we used to. We have access to what we want to read, more choices. This means we need to be our own filter--a skill we must teach children. Since most people get distracted by links and may never finish what they started reading, you can control the reader by how many links you put into your post and where you place them. Book Glutton--read books socially and synchronously with others. What about schools that don’t have access---are these students the new illiterate? Do we control the tool or do we adapt to the tool? What does it mean to be a patient reader? Are we witnessing evolution and how big of a deal is neuroplasticity? We used Livescribe pens to record our discussions. As certain topics were discussed, I made markings on the special Livescribe paper. This allowed us to easily find parts of the conversation by clicking on the marks I made. It was difficult, but very cool. Learning spaces should allow for a variety of learning areas. Schools should be open to the world through the use of windows and by designs that allow each learning space to access the outdoors. There should be a space where students can lounge or relax. Should we still use the word "classroom" when much of our learning might not be contained within walls or learning might occur across many physical spaces? are we saying anything new?--- I find that the group of educators that attends Educon tends to be of the same outlook, mindset and viewpoint. Many of the conversations we have had over the weekend are nothing new. How many times can we hash out an idea and say "We should do something about this" before something actually gets done? what are the new conversations?---what do we really need to be discussing as we move forward into the new year? I have some pretty awesome friends that I only get see at special gatherings like this--social media is powerful, but nothing beats meeting someone face to face and seeing that they are just the same as they are in 140 characters. What's more, nothing beats face to face...period.